A production still for the Fox Hearst film "Romance of the Reaper". The film was produced by International Harvester to celebrate the Reaper Centennial. 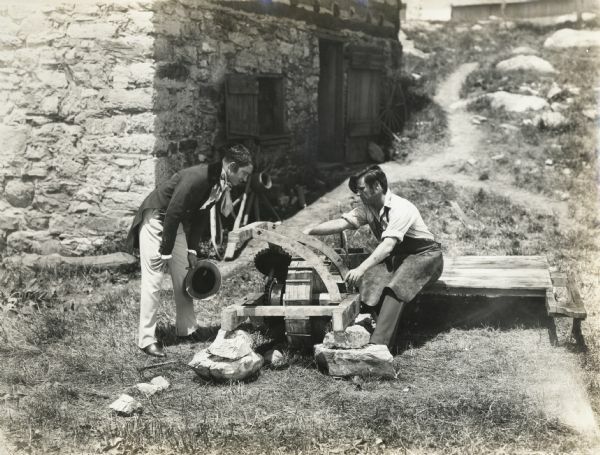 Caption on back of photograph reads: "Cyrus Hall McCormick, (Del McDermid, professional actor) working on reaper outside forge shop, with William G. McCormick (Sam McClure, local boy) oldest of three younger brothers, assisting and looking on."